1. Oleogel N Reduces Essential Fatty Acid Deficiencies. Fatty acids (lipids) make up all cell membranes, including skin cells. Healthy skin cells work in synergy to build a strong skin barrier. 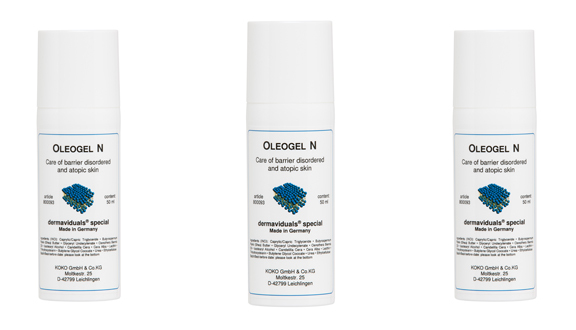 Oloegel N aids in the prevention and correction of skin barrier and cornification disorders and also lowers the rate of trans epidermal water loss (TEWL), keeping your skin healthy and beautifully soft. Oleogel N is free of water (so no bacteria can live in it) and is made up of a composition of vegetable oils, barrier substances (including Shea Butter), Evening Primrose Oil and Urea. Fatty acids from vegetable oil are responsible for the silky soft texture of Oleogel N, as well as excellent oxidative stability and anti-oxidant protection. The skin’s ageing process is characterised by the skin’s irregular desquamation and loss of corneocyte compaction, which leads to rough skin. Urea provides humectant properties in Oleogel N (natural humectants deplete with age), allowing it to heal dry and flakiness, keeping your skin soft and supple. Not only does urea provide moisture, it is also a natural exfoliant. Combined with lactic acid in the skin, urea works to remove hyperkeratinisation improving cellular turnover and in turn improving the corneocyte compaction of the skin. Oleogel N contains Evening Primrose Oil, which has one of the highest concentrations of Gamma-Linoleic Acid (GLA). This is largely responsible for the healing properties of Oleogel N. GLA’s have been proven to reduce the symptoms of eczema by relieving inflammation, itching and flaking. In addition to this, GLA’s help to reduce acne by diluting sebum and therefore reducing the risk of pores becoming clogged. Furthermore, they help to treat rosacea by reducing inflammation and by producing prostaglandins, which stimulate the contraction of blood vessels. Not only does Oleogel N do everything we just talked about, you can use it on your enitre body. It’s fantastic for nails, hands and feet during at-home manis and pedis. It can be used as an intensive treatment for dry elbows and knees. This beauty can also soothe barrier disorders on the scalp. 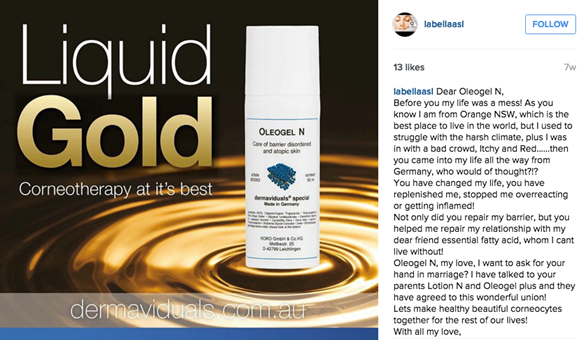 …and if you need further convincing, just ask La Bella Advanced Skin & Laser who have asked for Oleogel N’s hand in marriage! Before you my life was a mess! As you know I am from Orange NSW, which is the best place to live in the world, but I used to struggle with the harsh climate, plus I was in with a bad crowd, Itchy and Red……then you came into my life all the way from Germany, who would of thought?!? You have changed my life, you have replenished me, stopped me overreacting or getting inflamed! Not only did you repair my barrier, but you helped me repair my relationship with my dear friend essential fatty acid, whom I can’t live without! Oleogel N, my love, I want to ask for your hand in marriage? I have talked to your parents Lotion N and Oleogel plus and they have agreed to this wonderful union! Let’s make healthy beautiful corneocytes together for the rest of our lives!